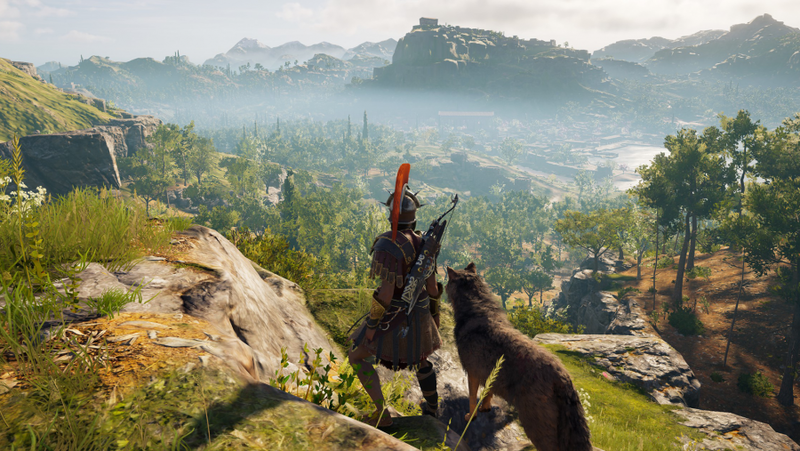 It’s hard being a lone wolf in the world of Assassin’s Creed Odyssey. Like Odysseus trapped between Scylla and Charybdis, you are hounded on both sides by Spartan and Athenian forces, so the best route forwards is to expand your pack. While you can buff out the crew of your ship, the Adrestia, I’d suggest you tame a wolf (or other wild animal). In theory, as in real life, it’s pretty straightforward to tame a wolf. You get to level ten, at which point a second tier of your skill tree opens up, and select the Beast Master ability in the Hunter branch. The ability gives you the option of taming unconscious animals by holding down the ‘E’ key (‘A’ button on gamepad) over their unconscious form. 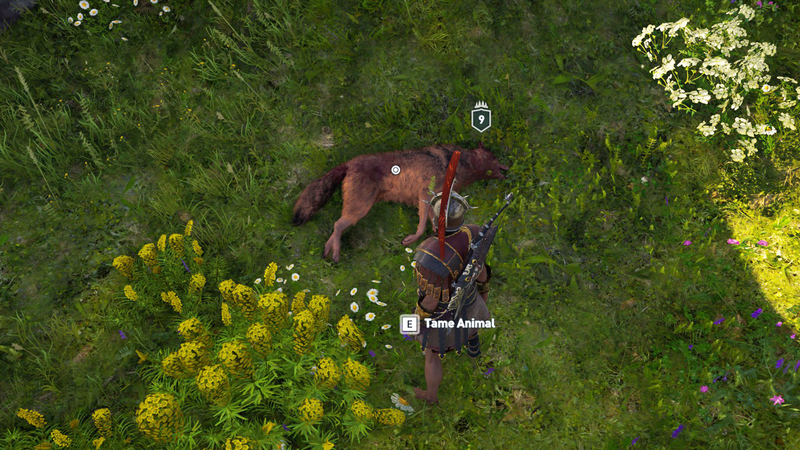 That’s all simple enough but you don’t just find unconscious animals laying about the place, and, speaking from experience, you don’t want to go manhandling a sleeping wolf. They get pissy. So, you’re going to have to knock the creature out. You can find wolves in many of Greece’s forests but you’re most likely to find them guarding the ruins found at the top of mountains. The animals are clearly drawn to decrepit Grecian architecture, just one of the many similarities between wolves and Classics students. Naturally, wolves are found in packs so don’t expect an easy fight. If you have the Spartan kick ability then what you can do is get one of the wolves down to low health before booting it in its hairy head to knock it out. Be careful which direction you hoof the beast because if it goes down the side of a mountain you may well kill it with fall damage, or, just as likely, have to go walking down the mountainside to find the body. However, there is always the chance you’ll get caught up in the fight and kill all the animals. So if you want a surefire knockout, and to earn the respect of noted burly author Ernest Hemingway, you should hop into your inventory and take the weapon out of your main slot, leaving yourself unarmed. When you’re fighting barefisted there’s no risk of killing your enemies, it’s an instant knockout when you get them to zero health – also good to know when it comes to press-ganging mercenaries into your crew. Once a wolf is under your command it will follow you anywhere on land, and if you mount a horse it will be able to keep pace with you. If you board your ship, though, you will have to leave the animal behind and tame a new beast wherever you disembark. If a tamed animal dies in combat it’s gone for good so don’t get too attached, or, as I learned, name it – it will make it all the more tearful when the inevitable end occurs. 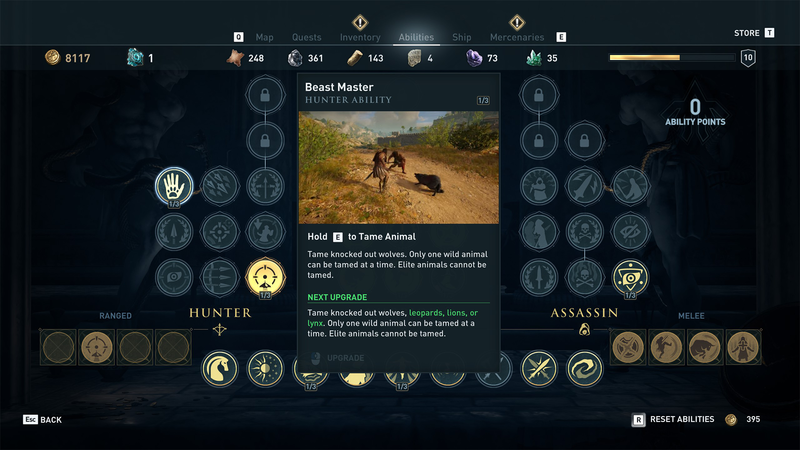 When you first gain access to Beast Master at level ten you can only use it to tame wolves but as you progress through the campaign you can tame other animals, too. The second tier of the ability lets you tame leopards, lions, and lynxes. Also, don’t go trying to tame an elite animal, Beast Master doesn’t let you do that. Once we hit level three we’ll update this guide with more info of what becomes available.